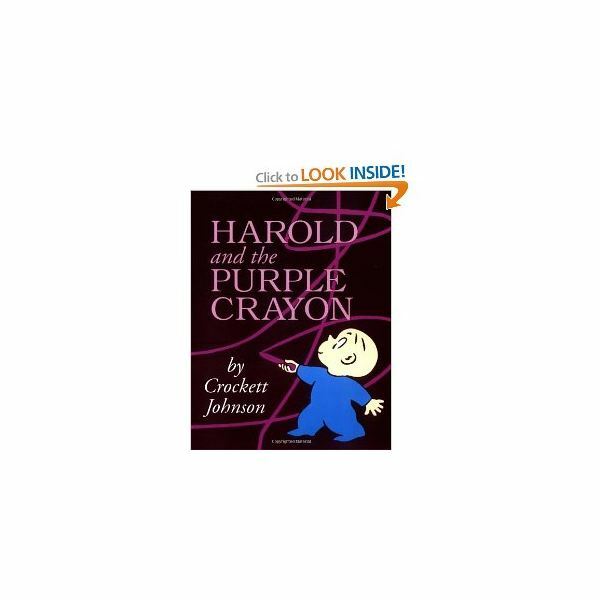 Harold and the Purple Crayon has been a classic book for children for over 50 years. It was written and illustrated by Crockett Johnson in 1955. A little boy wanted to take a walk in the moonlight one evening, but first he needed to draw the moon and a path with his over-sized purple crayon. It’s amazing how this crayon took him into all kinds of adventures just by drawing what he wanted and imagined. Getting tired, the little boy was in search of his bedroom window and the purple crayon took him high and low to find it. He eventually finds that drawing a window around the moon gets him to his destination – he evens draws his bed, crawls in and falls fast asleep. After reading the book reinforce the concepts with some of the following activities. These projects teach children about imagination and the color purple. Discuss the difference between real and make-believe with the children. Was Harold's adventure real? Invite the children to use their imaginations and share some make believe adventures of their own during circle time. Can you do anything with your imagination? Distribute a sheet of paper and a purple crayon to each child. Have the children draw their own fantastic adventures. As they share their drawings and stories with the class, write a short synopsis of their adventure on their papers. Cut a strip of poster board about 3-inches wide and long enough to fit around the child's head. Give the children purple crayons to draw pictures or designs on the strip. Staple the strip closed to make a hat. Then trace the child's hands onto purple construction paper. Help them cut these out and staple the hand-shapes to the back of the hat for moose antlers. Cover all stapled areas with clear tape to avoid scratches and pulling of the hair. Give each child a white paper plate (not the foam kind) and invite them to paint it purple with non-toxic tempera paint. When dry, pass out (or have the children cut out) shapes from construction paper for the eyes, nose, and mouth. Together cut out large purple and small white triangles from construction paper. The purple triangles can be glued onto the top of the plate for spikes and the smaller white triangles can be glued at the mouth for teeth. Tape the entire plate onto a craft stick as a handle for puppet manipulation. Have the children cut out a square basket and balloon circle from purple construction paper using safety scissors. They can decorate both shapes with crayons, markers, and/or stickers. Give each child three pieces of yarn and help them to tape the one end to the square basket and the other end to the circle balloon. Do this with all three pieces of yarn. The teacher can punch a hole at the top of the balloon and hang these in the classroom using an additional piece or yarn or a metal S-shape made from a paper clip. The children will enjoy watching these hot-air balloons float through the air. Show the children how they can take two primary colors, red and blue, to make the secondary color purple. On a paper plate, place a dollop of red paint and then a dollop of blue paint. Invite the children to mix the two colors with a paintbrush. What happens? Two fun colors can make an additional color. This can be an introduction to color mixing. Brainstorm about all the purple things we see, eat, smell, and touch. As you look through the book’s simple illustrations you may think of other projects you can create in the classroom. Remember that you can do almost anything with just a little imagination! Looking to extend the lesson? Why not try making your own recycled crayons in the classroom!